Shopping for Thomas the Tank Engine Playsets? 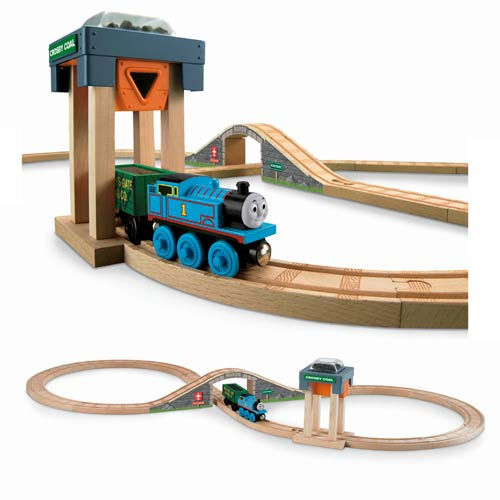 Help Thomas be a really useful engine in our Wooden Railway Figure 8 Coal Hopper play set! Ride Thomas around the track, over, or under the bridge. Stop Thomas at Coal Hopper, and press down on the top of the Coal Hopper to load Thomas' Cargo Car with Coal! Set includes: Thomas Engine, cargo car, removable coal cargo, stop sign and signal crossing. Works great with any Thomas and Friends Wooden Railway Engines, destinations, accessories, and train sets! Ages 3 and up.